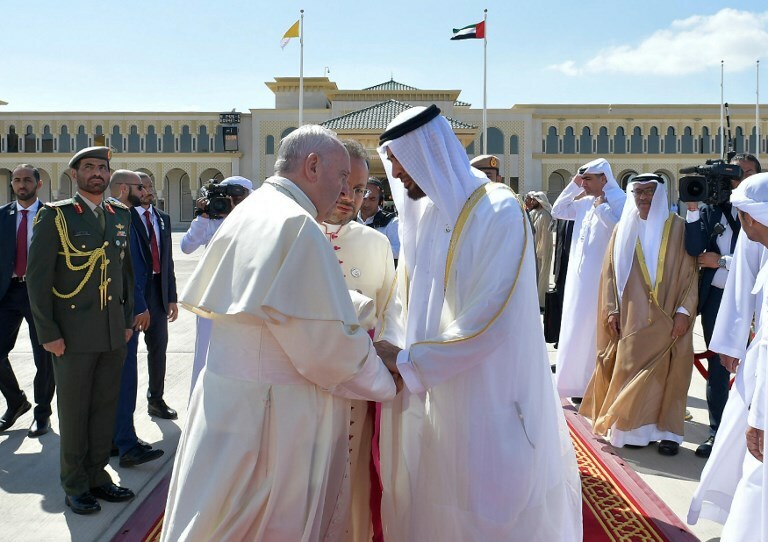 ABU DHABI: The curtain fell on the historic visit of Pope Francis to the Arabian Peninsula at a Catholic mass in front of an estimated 180,000 worshippers in the UAE capital Abu Dhabi. He reinforced the Christian themes of religious humility, understanding and peace. Sharing an altar with Christian and Muslim leaders, Francis delivered a 25-minute homily rich in Christian tradition. Delivered in Italian followed by an Arabic translation from an assistant beside him on the outdoor altar, the pope assured the congregation that they were each blessed. "Dear brothers and sisters, in the joy of meeting you, this is the word that I have come today to say to you: Blessed,” he said. Much of the mass — which lasted one hour and 45 minutes — was in English, with key parts of the liturgy in traditional church Latin. "You are a choir composed of numerous nations, languages and rites, a diversity that the holy spirit loves and wants to harmonize ever more, in order to make a symphony,” Francis said. He based his sermon on the Beatitudes, a series of eight blessings from the Bible that he used to underline the anti-materialistic message that he had highlighted in his speech on the first day of his visit. "We see in them (the Beatitudes) an overturning of that popular thinking, according to which it is the rich and the powerful that are blessed,” the pope said. The mass was attended by Sheikh Nahyan bin Mubarak Al-Nahyan, the UAE’s minster of tolerance, and by the grand imam of Al-Azhar Mosque, Ahmed Al-Tayeb. Also present was Bishop Paul Hinder, head of the Catholic Church in southern Arabia. محمد بن زايد في وداع قداسة البابا فرنسيس بابا الكنيسة الكاثوليكية لدى مغادرته البلاد بعد زيارة رسمية استغرقت ثلاثة ايّام .. مشيدا بدوره في تعزيز أسس السلام والتآخي والتواصل الانساني. To resounding cheers, Hinder thanked Abu Dhabi Crown Prince Sheikh Mohammed bin Zayed Al-Nahyan, who originally extended the invitation to the pope.